Bengaluru: Karnataka Second PU results 2018-19 has witnessed a passing percentage of 61.73. The results were announced this morning at the Office of PU Board in Bengaluru by the Department of Pre-University Education Director C. Shikha and Principal Secretary, Primary and Secondary Education Department S.R. Umashankar. Compared to last year’s results (59.56 percent in 2017-18), the results this year have gone up by 2.17 percent. As many as 6,71,653 students had written the 2nd PUC exam and a total of 4,14,587 students passed. While 68.68 percent of freshers have passed, 27.37 percent repeaters have cleared the exams. 27.62 percent private candidates have passed this year. Udupi district has topped the list with 92.20 percent followed by Dakshina Kannada with 90.91 percent. Kodagu district stood third with 83.31 percent. Mysuru, with 68.55 percent, secured 15th place. Even Vijayapura has secured 68.55 percent and has been placed in 14th place. Chitradurga district has secured 51.42 percent and is at the bottom of the list. Girls have once again outdone boys with 68.24 pass percentage, whereas boys have scored 55.29 percent. Besides, rural students have scored more than the urban. Karnataka’s rural PU students scored 62.88 percent and urban students secured 61.38 percent. Students with special needs have performed well. 391 students with Dyslexia had appeared for the exam and 236 of them passed with a total of 60.35 percent. Pass percentage among ortho-impaired students is 69.83 percent. Visually impaired students have got total 76.14 pass percentage. A total of 80 colleges have got 100 percent results while 98 colleges have scored zero percent result. As per the statement issued by the Department of Pre-University Education, 2,447 students secured 100 out of 100 in Mathematics paper. In the Arts stream 2,00,022 appeared and of them, 1,01,073 have passed achieving a total pass percentage of 50.53, in Commerce stream, of 2,53,865 students, 1,68,531 have passed (66.39 percent). In the Science stream, 2,17,766 students appeared and of them, 1,44,983 have passed achieving a total pass percentage of 66.58. In the Kannada medium, 2,94,002 appeared for the exam and of them, 1,61,923 have passed (55.08) and in the English medium, 3,77,651 appeared and of them, 2,52,664 have passed achieving a total pass percentage of 66.90. THE TOPPERS: In the Arts stream, S. Swathi of Kottur Kudligi Independent PU College, Ballari, secured the first place with 595 marks, S.V. Ramesha of the same college in Ballari stood second with 593 marks and Goravara Kavyanjali, also from the same college, secured third position with 588. All the five toppers in the Arts stream are from the same college. In the Science stream, Kruti Muttagi from VVS Sardar Patel PU College, Bengaluru, stood first with 597 marks, S.L. Mohan from Masters PU College, Hassan, stood second with 595, S.R. Anarghya from Sharada Independent PU College, Mangaluru, also stood second with 595 marks along with P. Ankitha from Govinda Dasa PU College in Mangaluru who also got 595. Shraddha G. Pai from Sharada Independent PU College, Mangaluru, stood third with 594. In Commerce, Varshini M. Bhat from Vidyamandir Independent PU College, Bengaluru, is the topper with 595 marks along with S.R. Amruta from ASC PU College, Bengaluru, who also secured 595. Shubhankar A. Chaugule from Alva’s PU College, Moodbidri, stood second with 594 along with Venkatesha Puranika of R.N. Shetty PU College, Kundapura, Aditi Atulkumar Surana of Sharada Independent PU College, Mangaluru and R. Poorvitha of Mount Carmel PU College, Bengaluru. 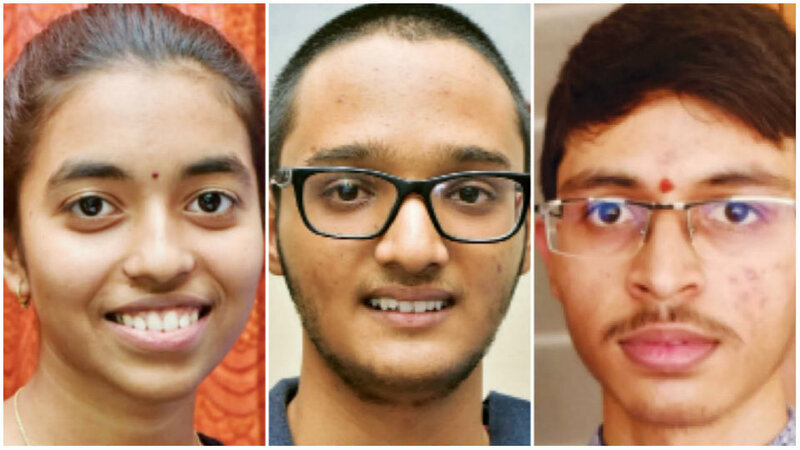 Third place in Commerce was secured by Aditi Upadhyaya of Mahaveer Jain PU College, Bengaluru, who scored 593 along with B. Chethan Pai of Alva’s PU College Moodbidri, N. Chandana of Vidhyanidhi PU College, Tumakuru and M. Nimishamba of VVN PU College, Bengaluru. In Mysuru, Ananya Kanigalapula of Sadvidya Semi-Residential PU College has topped with 590 marks (Physics 98, Chemistry 99, Mathematics 100, Biology 99, English 95 and Sanskrit 99). She is the daughter of Narasimha Rao and Adilakshmi. Sharandeep of Sadvidya PU College has scored 588 marks (Chemistry 100, Mathematics 100, Biology 100, Physics 99, Kannada 97 and English 92). He is the son of Puttaswamy and Umamani. Ajith Kumar of Vijaya Vittala PU College too has secured 588 (Physics 99, Chemistry 100, Mathematics 99, Computer Science 100, English 90 and Sanskrit 100). He is the son of Gajanana Rao, a Civil Engineer and Suma G. Rao. The PU exams were held from Mar. 1 to Mar. 18 for 39 subjects. In view of the LS polls, the exams were held early this year and results also announced early. Evaluation had begun on Mar.25 at 54 centres. DISTRICT-WISE STATISTICS – HOW THEY FARED? Really? Mr. HDK, please see PU results! I’m personally feel bad that my town (Mysore) kids not fair that well. Next time.